Comfortable sleep is a must for anyone. It is common to hear that lack of sleep can cause lot of health problems. There are several reasons that affect your sleep. Poor sleep can be due to some health conditions too. While heavy work load, stress and other health conditions can cause sleeping problems, your bed and pillows can be the culprits too. If you don’t have a comfortable bed then you will not enjoy comfortable sleep throughout the night. You may keep waking up during the night for few times. You will also experience pain on your body due to the wrong selection of your bed, mattress and pillow. Few weeks ago I experienced a neck pain which lasted for around one week. That was an awful time because I couldn’t turn my neck without pain. This can be due to the wrong pillow I use. However the experience reminded us to check our beds and go for new mattresses and pillows as we didn’t change those for a long time. During the past few years my concerns were more on the growth of the kid forgetting some of other stuff at home. My concerns were always about sleeping problems of kids than comfortable sleep for us as the first few years are really important for any kid’s life. But, why am I talking about Futon mattress and regular mattress in this post? Reason is simple. Living in Singapore, we own a small apartment/flat which we need to consider space usage when we buy anything. And if we buy new furniture we always need to discard or sell the used ones to save the space. Having our bedrooms furnished with beds and regular mattresses, we are considering options of buying a sofa bed or folding bed which we can keep in our living room and to use as an extra bed when there is a visitor. A kind of sofa bed will save space while we can use it as a seating space during the day time. Futon is the Japanese word for ‘traditional bed’. However, nowadays the word ‘Futon’ is used to identify ‘sofa beds’ or mattress that can be used as a guest bed. A futon can be converted to a bed when you want and to a sofa bed when you want to use it as a cushion or seating space. A futon with high quality mattress will help to sleep comfortably and will not give back pain. What is a regular mattress? There is nothing to explain. We use regular mattresses in our beds to experience a comfortable sleep. With layers and with springs and coils inside, a quality regular mattress gives a firm bed making it comfortable to sleep. However, a regular mattress is heavier than a futon and also it is more expensive to buy when comes to a high quality mattress. Anyway as my requirement is to find a mattress that is easy to use as an extra bed, I prefer to go for a futon which I can use in the living room. In such I like to consider both quality and aesthetic value by selecting a good design for a futon. 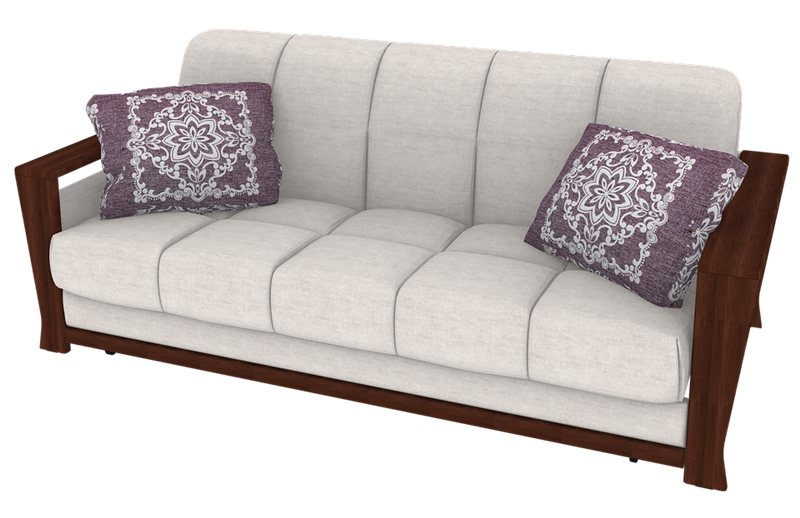 After comparing few futon designs I am thinking of a futon that comes with a wooden frame due to the beautiful look of it as a sofa. On the other way, timber frames are durable and will create a firm bed. How to buy a Futon? Before you buy a Futon mattress, there are several factors to consider. First, think of the place you use it. Will you keep it in a bedroom or in living room? Are you going to use it regularly or once in a while? Will the futon matches with your current furniture or style of home? Above are some questions that you need to ask from yourself before starting to check different futon designs. Once you have the basic idea of a futon, a well explained futon mattress buying guide will be really useful to select the most suitable futon for your home comparing the quality of mattresses. Below are some specific things and considerations about futon which you need to know before you buy a futon. Be sure to know the space you have because futons can be larger than you expected when it is unfolded. Therefore, know the measurements before you buy. Check the type of frame of futon when you decide on the futon. If it is a steel frame, it will not take much space than a wooden frame. Futons are available as bi-folds and as tri-folds. Consider the best option for your home when you select a futon. Don’t forget the mattress. As there are beautiful futon designs available, you may end up selecting the beautiful design that gives the best look as a sofa. But, don’t forget the mattress. It should be comfortable, thick enough and durable. After all, a futon will serve as a comfortable bed. That should give a pain free sleep making it a comfortable bed when need. After comparing the options of a futon and a regular mattress for my home, I already decided to buy a futon as it saves the space. Before buying a futon it is necessary to check the type of frame, size and mattress quality in order to select the best futon matching with the needs. Do you own a futon? Please share your experiences below.